As most of you know, this past weekend was the DC Pen Show, the largest pen show held in the USA. Private Reserve Ink has a history of doing special inks for the DC show. Several are now a permanent part of the PR ink line: DC Supershow Blue, DC Supershow Green, and Electric DC Blue. This year, they have released DC Super Violet. This ink, however, is a limited edition ink. There are only 500 bottles available. The bottles are large at 110ml and the cost is quite affordable at $10 a bottle (MSRP). Even if you did not attend the show, you can still get the ink. I purchased my bottle from isellpens.com . Pendemonium also had some for sale, but theirs is priced above MSRP at $13. Now, I usually don’t go for limited edition inks because I hate the feeling of getting attached to something that may not be available later on, but I just could not pass this one up. I love everything purple, and this ink falls squarely within the portion of the color range that I love most. The bottle is huge at, and I have a lot of inks anyway. I probably won’t run out any time soon, so the fact that the ink is limited shouldn’t be a problem (at least that’s what I’m telling myself). DC Super Violet is a medium-dark purple. Just like I like it. It is a very true sort of purple. It straddles the line between blue and red. It is similar to Diamine Majestic Purple, but DCSV has a brightness that MP lacks. It is also similar to Rohrer & Klingner Cassia, but DCSV is a little more saturated and brighter than Cassia. 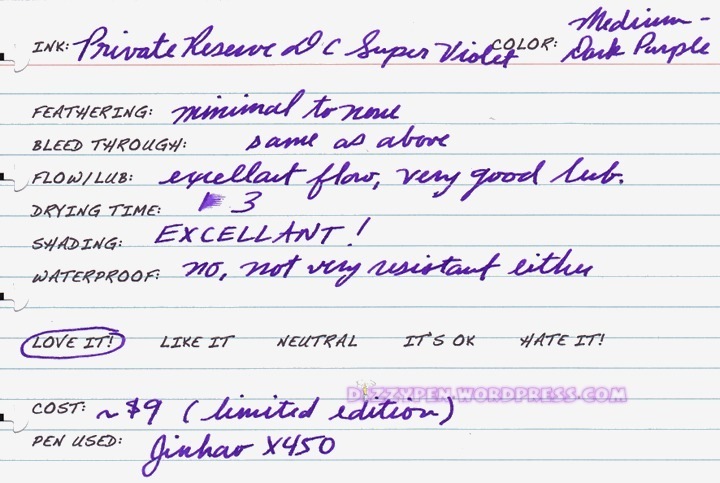 To my eye, DCSV is the perfect purple counterpart to DC Supershow Blue: Rich, bright, and a true representation of the color. Generally, there is no feathering or bleeding though you can get a minimal amount of the two depending on how wet your nib is and the quality of your paper. The Jinhao nib is super wet. I get slight feathering on everything except Rhodia et al. The flow is superb and the lubrication is quite good as well. This ink dries pretty quickly depending on the paper. I’d say it’s about 3 seconds on absorbent paper to about 20 on Rhodia (with a wet writer). The shading is wonderful even on regular paper, and it is outstanding on a coated paper like Rhodia. Unfortunately, this ink is not waterproof. It displays very little water resistance as well. All in all, I love this ink! It’s just such a shame that this is a limited edition color. Hopefully, they will make a version DCSV that is a permanent offering like they did with DC Supershow Blue. In the meantime. I will just cherish this bottle! If you want a bottle I suggest you move fast. This one won’t be around for long. This looks awesome. Thanks so much for posting a review and a writing sample. I’ve been using Iroshizuku Yama Budo and love it, but it’s not really a deep, “real” purple. It’s more of a burgandy/red wine type color. Gorgeous, but until I saw this I didn’t realize how much more purple it could be.